The acclaimed author talks about how a job taken in dire straits helped resurrect his writing career. When Craig Davidson answered a job ad for bus drivers in the summer of 2008, he wasn't the author of a short story collection that would become an award-winning film (Rust and Bone), and he wasn't the author of the Scotiabank Giller Prize-shortlisted Cataract City. He was just another failed writer who needed money in the bank. "I thought I would just drive a bus full of high school students and be a faceless driver to them," he says. "And it turned out to be completely different. I had no conception at all that I was stumbling into a life-changing and transformative year." 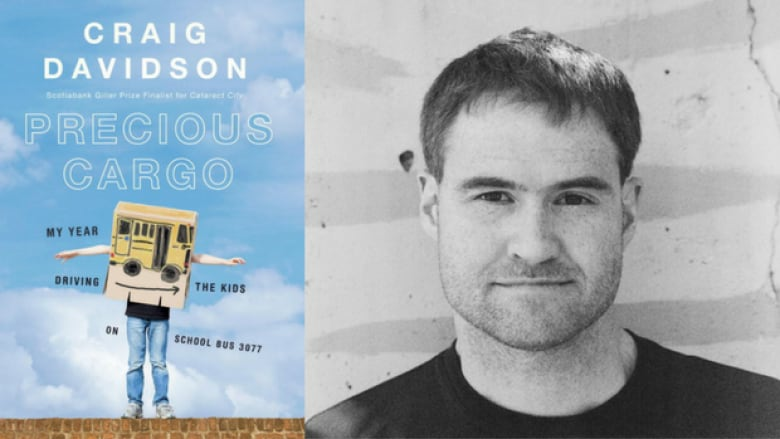 In his own words, Davidson talks to CBC Books about how his first nonfiction book, Precious Cargo: My Year of Driving the Kids on School Bus 3077, came to be. It's now a contender for Canada Reads 2018, where it will be defended by Greg Johnson. "When I started driving the special-needs bus, I was as poor as a church mouse and really needed a Joe job to pay the mortgage. As well, I had started to see myself as an entirely failed writer. In Precious Cargo, I wanted to convey to the reader how wrecked an individual I was at this point. Being honest about that period was important to me — maybe it's because I'm kind of self-flagellating and I think if I admit to something, that prevents me from making the same mistake again. "In this book, I wanted to let people know how I came into this situation. The danger was that I was saying in some way to these kids, 'Redeem me. Fix me.' And you can't expect that of any other person. We all have experiences that came along at the right time. I'd like to think that I also came at the right time for some of these kids — Jake especially — and helped through a deeply sad period. If I'd been a successful writer at that time, I never would have driven that bus. So in this sense, being a failure was a good thing. And in a vital way, the job kick-started my belief in myself." "I went through a period where I had no confidence that my writing was any good, and probably in a self-fulfilling prophesy kind of way, it wasn't any good. Your confidence and the way you carry yourself into a writing project often informs the worth of the project itself. I didn't get myself back into serious writing until halfway through the year of bus-driving, and that's the YA book that's threaded throughout this memoir, called The Seekers. "The kids on my bus were the DNA of The Seekers. I suppose at some point, I looked back in the mirror and saw those five faces and thought, these are five characters who each have everything a literary character would have. Their strong points, their flaws, their fears, what they're striving towards. An idea popped into my head at around that time. I would become a magpie and take aspects of all of them, and transpose them into the five main protagonists in The Seekers. The book, now, is in a drawer with other writing projects — the proverbial 'trunk novels.' And there it sits. I don't know what will become of it, and if nothing does become of it, that's perfectly all right. It may have filled its purpose for me." "For the few months of driving the bus, I would write things that happened on scraps of paper — route assignment sheets, wrappers, whatever was lying around. Someone on the bus would say something amazing and I'd think, 'Wow, I've got to get that down.' When I stopped and let someone off, I'd scribble something on a gum wrapper or wherever. I started taping these scraps on my wall near my computer desk and my brother came over and said, 'This looks like that scene from A Beautiful Mind where all those scraps of paper are festooned all over the walls.' And I became attuned to the fact that these kids were saying all sorts of wonderful, beautiful and true things, and I did start keeping a notebook at that point. I knew then that if I was ever going to remember these experiences, it needed to be with their exact words, because it's their unique perspective on the world as children. "I told all the kids and their parents once I knew I would likely write about this experience. Once the book was written, I made sure that I sent them the manuscript at its earliest stage. And if they had any issues with it, my editor and I were completely willing to address it. That hung over the whole project — that if any of the parents or kids objected, the book would be scuppered. But when I was writing it, I always kept in the front of my mind that there are other people involved here. This weighted down every keystroke of writing the book — as it should have." Craig Davidson's comments have been edited and condensed.